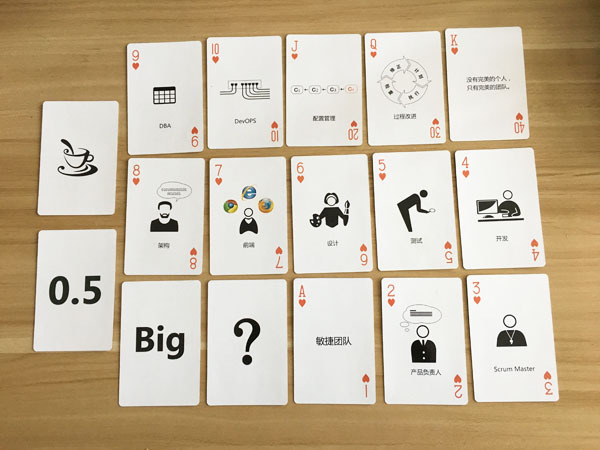 Scrum poker, AKA planning poker, is a consensus-based tool for estimating and planning effort/man-hour in software development projects, especially in Agile development, such as Scrum and Extreme Programming. It was first designed by James Grenning and became popular in Agile Estimating and Planning written by Mike Cohn who made Planning Poker a trademark and an online tool. Using Scrum poker, you can quickly initiate sprint planning meeting, estimate man-hour more accurately by voting, and save time on coordinating. Team members gather together and choose cards to represent the number of man-hours they estimate for the task. By placing cards face-down on the table, it minimizes the influence on others by speaking that out. Project Management software tycoons, such as JIRA, has its own scrum poker add-on. You can integrate it, if you use Jira. If you prefer a physical poker, you can try ZenTao poker. Heart, Spade, Diamond, and Club. Each suit is for one player. 14 cards in each suit, 0.5, 1-10, 20(J), 30(Q), 40(K). Special card, ? (questions), Big (too big), Cafe(break). Since it is like a poker game, there are rules to follow. Each developer chooses the card and show them at the same time. If the estimates are close, take the mean. End of the game. If not, the one who chooses biggest and the one the smallest should explain. Then re-estimate it for no more than three times. If not estimable, use special cards. ZenTao is open source project management tool designed by an Agile team and for Agile teams. It is an All Lifecycle Management, covering the whole process of software development. What distinguishes it from other project management tools is that ZenTao divides the complex project management process into four major items: story, task, bug, and case, through which ZenTao supports the whole flow of management.